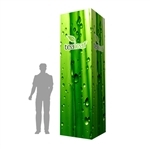 Increase the visibility of your brand with a larger-than-life trade show tower! These lightweight structures help people remember where you are and, of course, who you are. Your brand can be seen from the very moment attendees enter the trade show hall. Combining a tower with a hanging sign is an unbeatable formula for attracting visitors to your booth and spreading your message far and near. 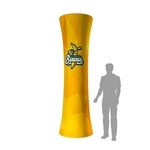 Different types of towers and pillars will work in particular ways, according to your needs. We also offer smaller tower banners that could help you divide the space or reorder visitor circulation while making your brand shine. Ask for backlit options.